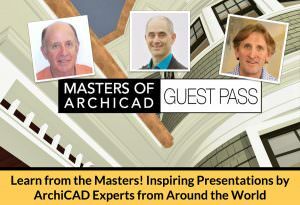 The Masters of ArchiCAD Summit draws near! 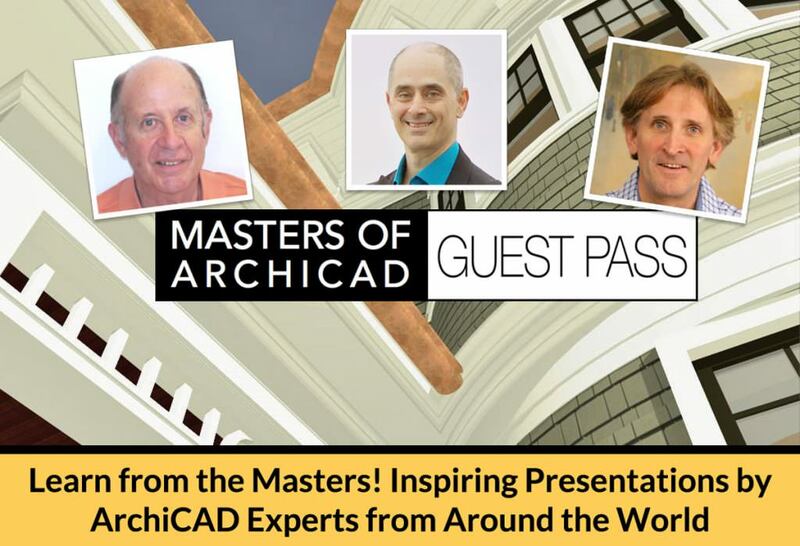 Advance registration discounts end at 11:59 pm PST on Wednesday, in preparation for the opening of the MASTERS of ArchiCAD SUMMIT on Thursday morning at 9 am PST. If you haven’t yet signed up, don’t miss out – go to the home page of this website to register! NOTE: After Wednesday, you’ll still be able to register, however all advance pricing discounts will go away, and everyone will pay $197 (still a bargain!). Preparations continue apace, with run-throughs and website development underway. Graphics are being prepared for the slides, and technical details are being worked out. Signups are accelerating, and we now have 168 registered for the event, with 200 – 300 projected. Andreas Lettner – Cinerender Tips and Tricks – Andreas has prepared a Cinerender tip sheet plus a sample file with embedded HDRI background images, as well as rendering examples. Roderick Anderson – Design-Build: Luxury Residential done better with ArchiCAD and BIMx Docs – Roderick is giving away a BIMx Docs file from a real project complete with his custom pen sets (you’ll see in his presentation how these work to increase clarity and streamline communication); he’ll also supply the actual pen sets file so you can import it into your own project. Gary Lawes – Hacking GDL – Practical Parametric Object Making – Gary will be sharing some GDL object files he will create on the fly during the Summit presentation, as well as a tip sheet. Erika Epstein – Implementing Building Information Modeling – Interactive Schedule files for import into your ArchiCAD project plus PDF. shawn B hopkins – Informed Design – Shawn will be giving away two powerful, custom-built object tools along with accompanying schedules to make quantity take-offs and costing easier. Tim Ball and Andrew Passacantando both use Complex Profiles extensively, and will be sharing some of their favorites for you to study. Karoly Horvath – Modular Design and Teamwork Strategies for Multi-Unit Projects – Karoly will share his sample project file illustrating the modular concepts he’ll be showing us. In addition, the slide deck presentation files will be posted as downloadable PDF’s. These are all in addition to the recordings of the presentations, which will be available shortly after the conference in the member area of this website. 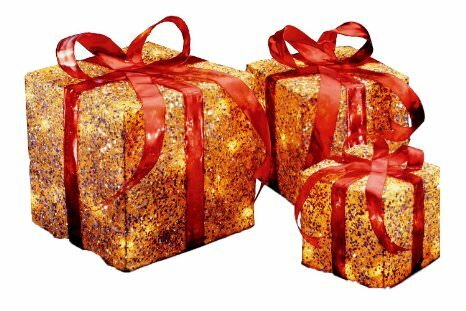 And this is on top of the “gift of knowledge” that each presenter will convey…which is truly the most valuable of all.